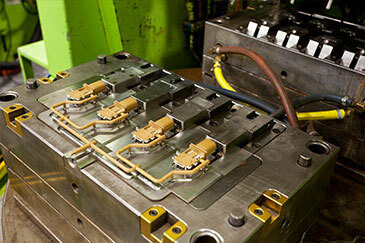 Sun Microstamping Technologies specializes in manufacturing complex components for our customers through Insert Molding. By encapsulating a variety of inserted components, such as Metal Stampings, Magnets, Bushings and Screws, we can provide a single component to meet a variety of applications. 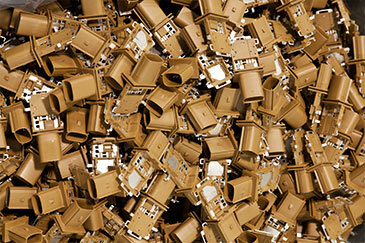 We accomplish this by utilizing Hand Loaded, Robot Inserted or Reel-to-Reel designs based on our customer’s needs. We take the risk out of Insert Molding by using proven experience in Mold and Die design to eliminate costly delays and insure on-time program launch. Having both a Stamper and Molder under the same roof enables us to offer our customers the benefits of a “ONE STOP SHOP” for insert molded components. This also allows our customers more control over production lead time, cost, logistic issues, less suppliers to manage and most importantly more control of the quality of the finished product. Sun Microstamping Technologies specializes in custom Plastic Injection and Insert Molding that feature a high degree of difficulty on both product design and high performance molding resins.